Wet to moderate moisture. Prairies, meadows. This is a 3′ to 4′ tall, perennial forb that rises on a single stem from a short caudex. It grows only in shade. It is a late bloomer, one of the last flowers to be seen in the woods in the fall. 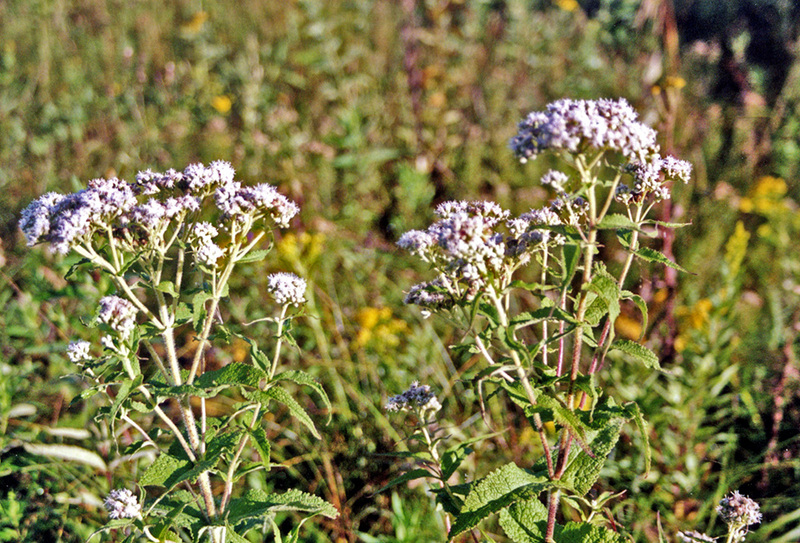 The stems are erect, branched near the top, leafy, and covered with long, soft, shaggy but unmatted hairs. 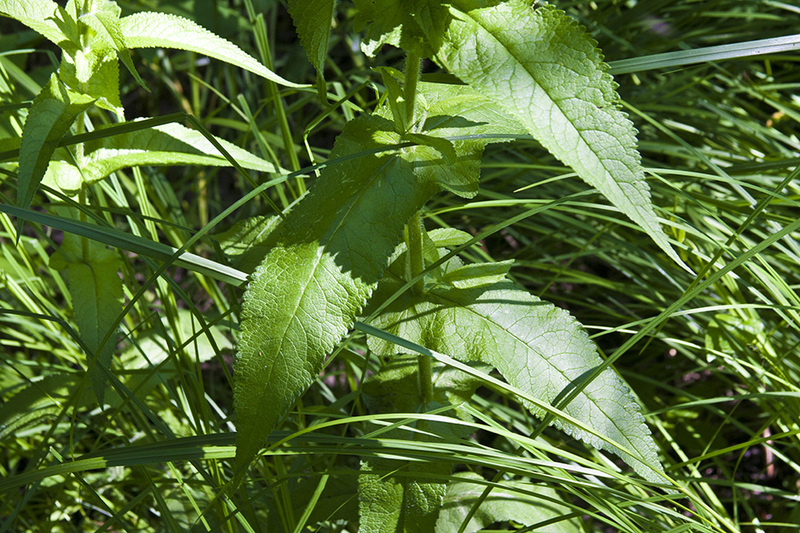 The leaves are usually in opposite pairs, though they are rarely found in whorls of 3. They are thin and lance-shaped, tapering gradually to a pointed tip and broad at the base. 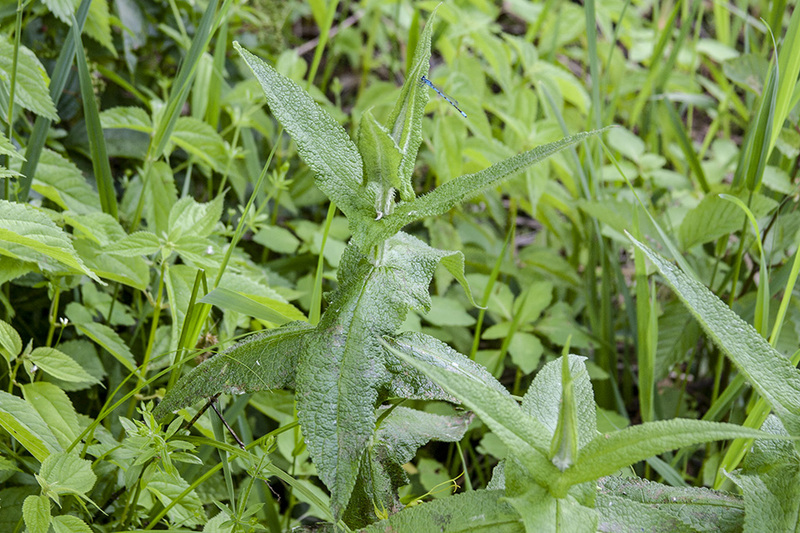 The lower leaves are 2″ to 6″ long and ⅔″ to 1½″ wide, becoming smaller as they ascend the stem. The bases of lower and middle paired leaves are fused together around the stem. The margins have rounded teeth all the way to the base. There is a conspicuous network of veins, depressed on the upper surface of the blade, giving the blade a wrinkled appearance. The lower surface is covered with short soft hairs. 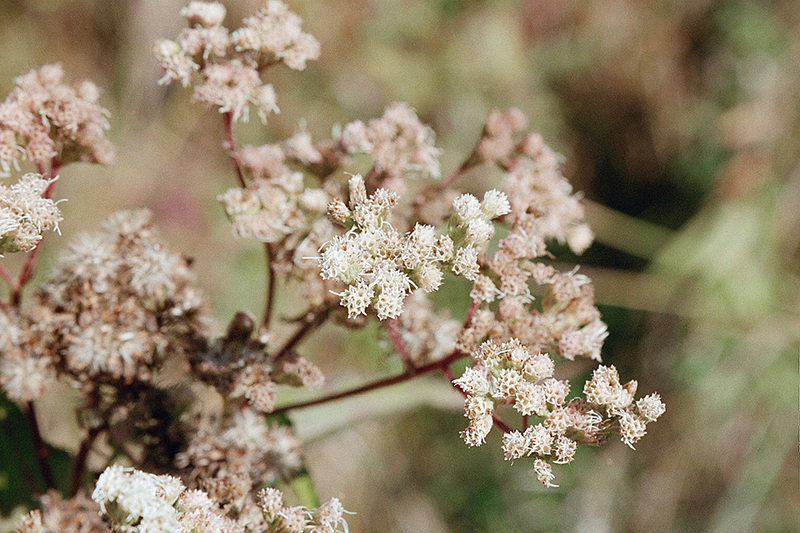 The inflorescence is a flat-topped branched cluster of many flower heads at the end of the stem and each side stem. Combined, the clusters are up to 6″. Each flower contains 9 to 23 disk florets and no ray florets. 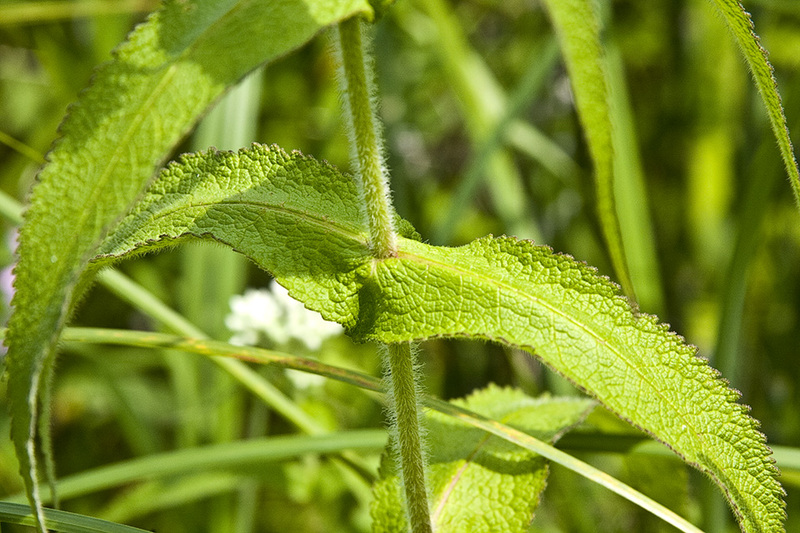 Each disk floret consists of a dull white flower tube with 5 short spreading lobes. A white, forked style protrudes from the floral tube well beyond the lobes. The flowers are fragrant. The fruit is a tiny dark achene with a small tuft of 20 to 30 white hairs about ⅛″ long. 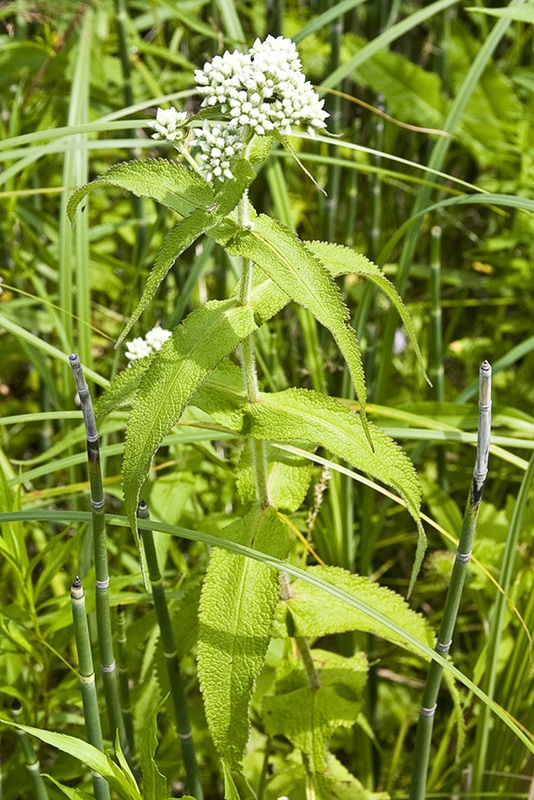 Tall boneset (Eupatorium altissimum) leaves are not fused around the stem at their bases. They have 3 prominent parallel veins, not a conspicuous network of veins. 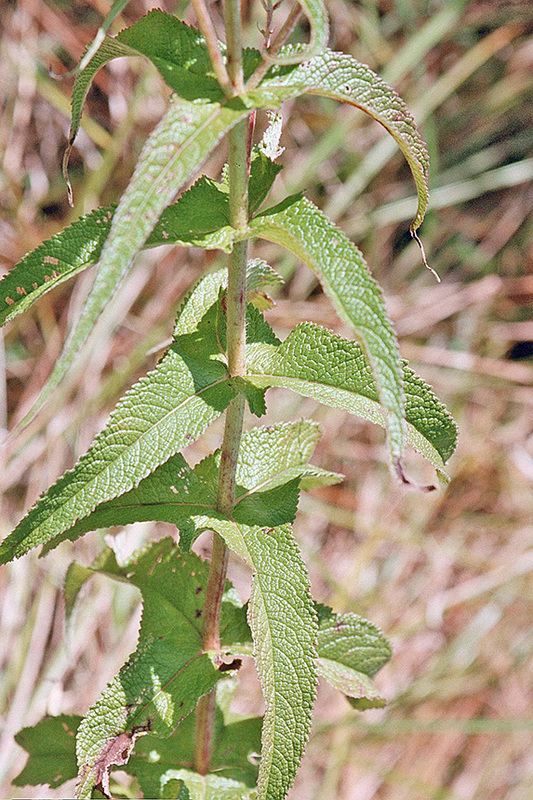 The leaf margins are untoothed near the base, with sharp, forward-pointing teeth above the middle. Each flower contains just 5 disk florets. The flowers have little or no fragrance. The fruit has a tuft of 30 to 40 light brown hairs. 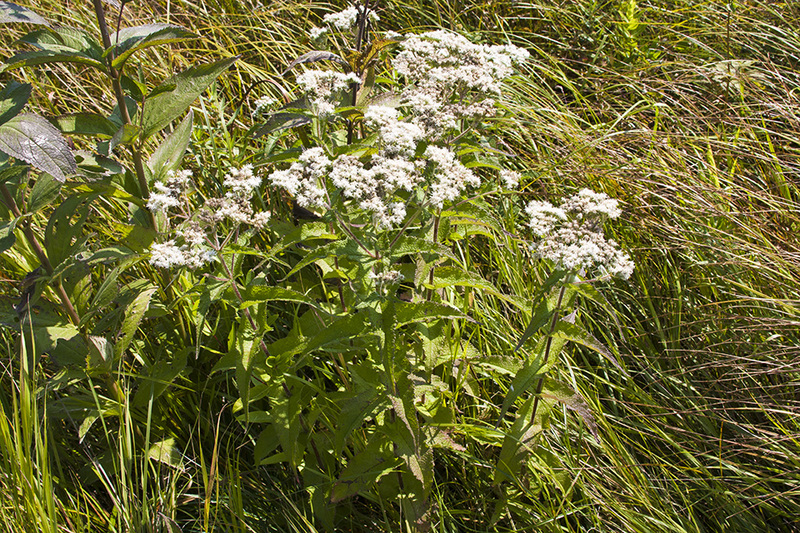 Upland boneset (Eupatorium sessilifolium var. brittonianum) leaves are not fused around the stem at their bases. The veins are arranged like the vanes of a feather, with a single prominent midvein extending from the base to the tip and lateral veins originating from several points on each side (pinnately veined). 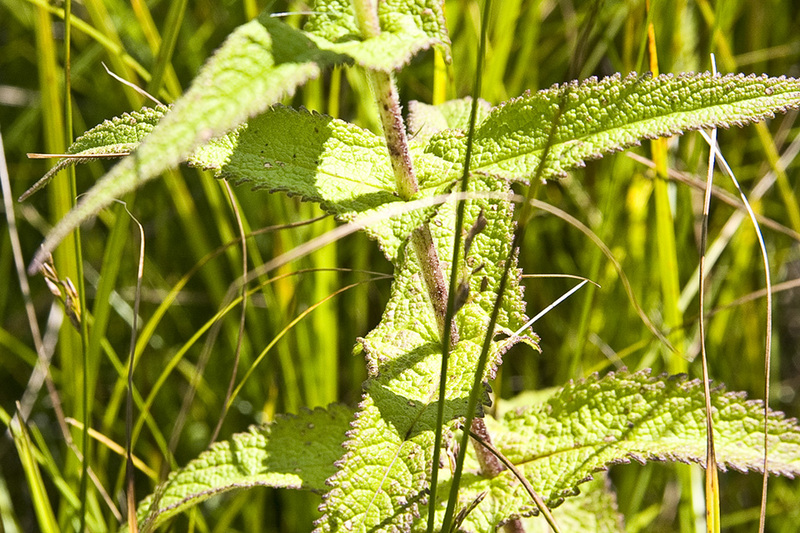 The leaf margins are untoothed near the base, with sharp, forward-pointing teeth above the middle. Each flower contains just 5 disk florets. The flowers have little or no fragrance. The fruit has a tuft of 30 to 40 light brown hairs. 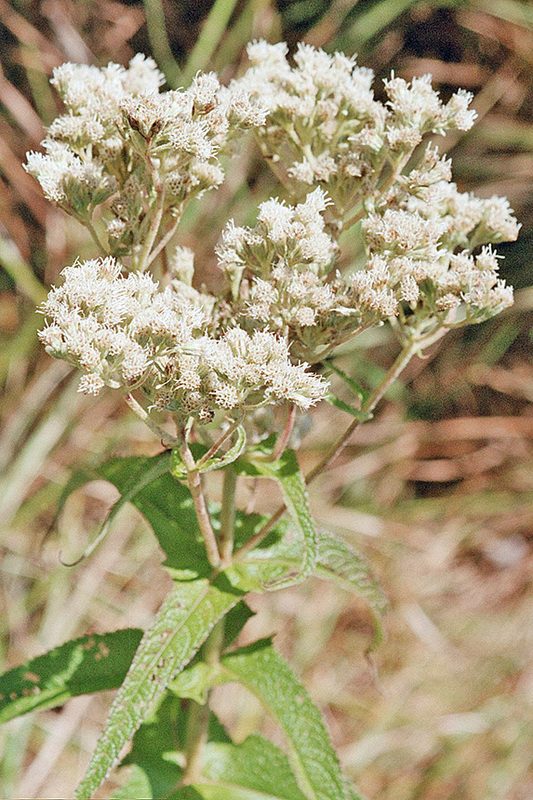 White snakeroot (Ageratina altissima var. altissima) leaves are shorter, wider, and on long leaf stalks. 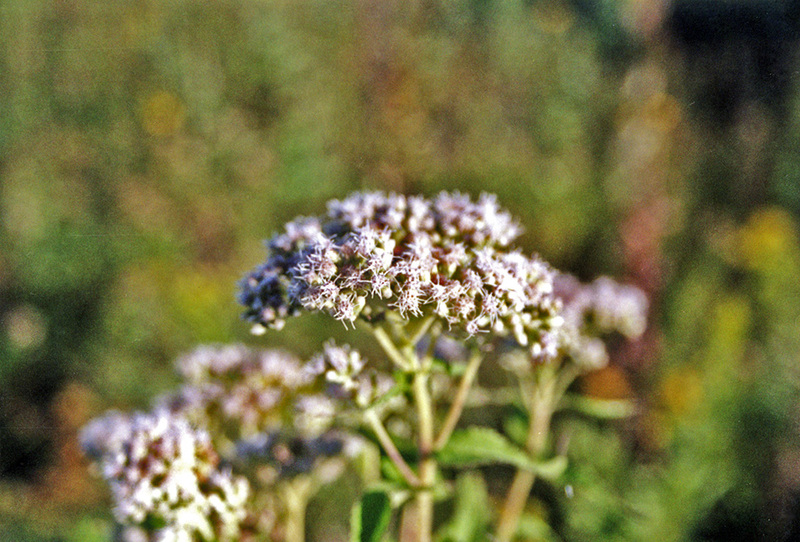 The flower heads are much larger. It is found in woods, always in shade. Rare form: A plant with whorls of three fused leaves. 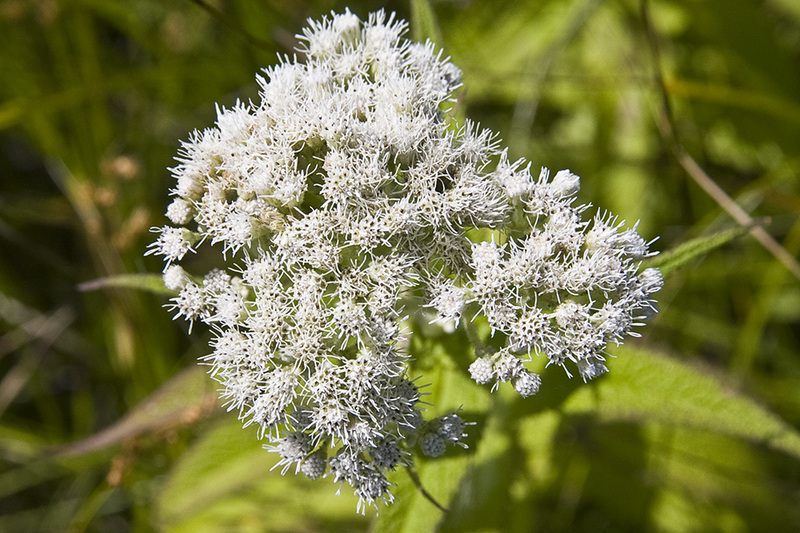 Information about Boneset (Eupatorium perfoliatum). I am the owner of Natural Gardens specializing in Michigan Native Plants, Butterfly and Wildlife gardens. 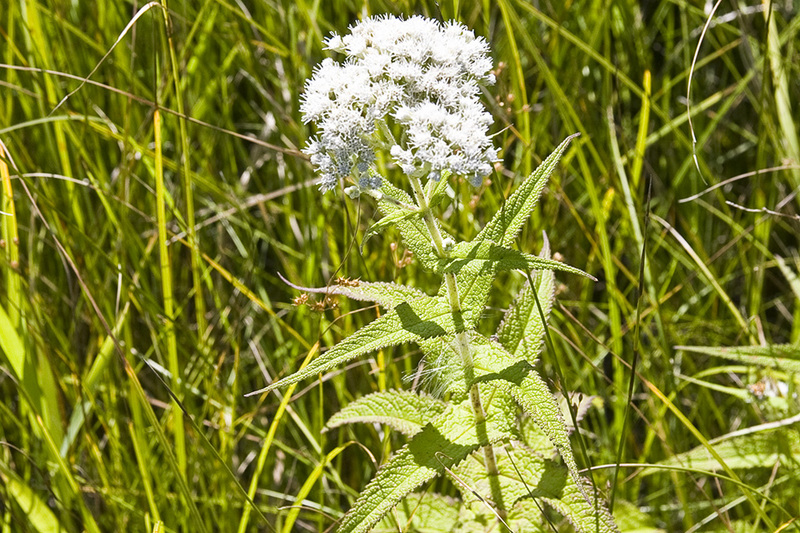 I am also a member of Wildflowers Association of Michigan (WAM) and Wild Ones (North Oakland chapter). Please feel free to send me questions.